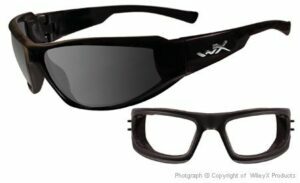 Wiley X, a standard bearer in the prescription safety eyewear field, has long offered frames that offer the perfect combination of form and function. Today we’ll take a look at some examples of a Wiley X subseries that takes style and protection to a whole new level: the Jake series. Jake frames come in several varieties, all of which feature a seamless hinge that increases durability. If you’re in the market for safety frames, you know that your activities demand the upmost in durability, and seamless hinges retain the rigidity of a one-piece safety frame. Jake frames also earn high marks in their American National Standards Institute rating, exceeding ANSI Z87.1-2003 high velocity requirements. Wiley X knows that you’ll be using your safety glasses under a variety of conditions. Condensation, drizzle, sweat, mist, and other body heat- or weather-related moisture issues can easily stop you in your tracks with a layer of vision-restricting fog. That’s why they’ve designed Jake frames with a trademark top-down ventilation system, which directs air flow downward and out bottom vents to keep your eyes cool and your lenses dry. Jake frames are a subseries of the popular Wiley X Climate Control line. As such, they all feature a unique removable facial cavity seal that blocks wind, keeps out debris, and eliminates peripheral light. This seal, made of flame retardant multi-layer foam, pops out simply and easily when not in use and is replaceable. Find the Wiley X Jake lens selection you prefer, whether you require corrective lenses or not, and enjoy sleek, comfortable eye protection anywhere you go. Yes we can. Please email Melissa at mrichard@phillips-safety.com, and she will be able to assist you with this. Reading this info So i’m happy to show that I’ve a very excellent uncanny feeling I found out exactly what I needed.